Let’s begin by exploring the wrong and the right way to exercise so as to avoid flare ups. 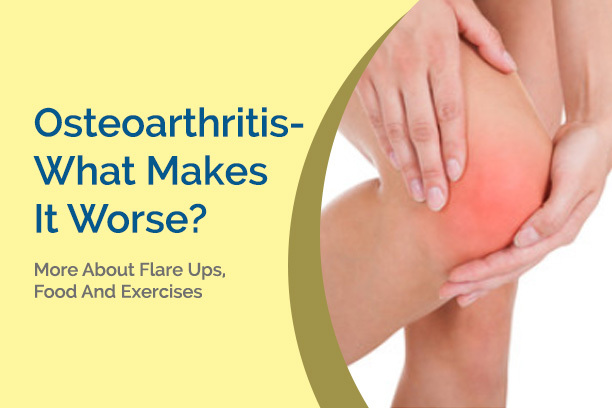 See, osteoarthritis flare ups can occur if the exercises you are doing is performed incorrectly, or for too long a duration, or at a higher intensity than you are realistically capable of withstanding. All of these can lead to a flare up that can be quite painful! If these flare ups are chronic and increasing in intensity, please make sure to seek the help of a medical professional. A physiotherapist is always the best way to go to develop an actionable exercise plan as well as provide the proper training required when exercising so as to minimize strain and injury. These exercises typically look like motion exercises, low-impact cardiovascular exercises and some light muscle-strengthening routines. If the flare ups are located in the knee or hip, you absolutely should avoid running (yes, even jogging), skipping rope, any kind of high-impact or high-strain aerobics, or any activity that requires you to jump or lift both feet off the ground at once! Don’t worry! There’s still plenty of great exercises you can do even with these off the list. As mentioned above, cardiovascular exercises like swimming or cycling are excellent ways to keep healthy while avoiding causing the painful flare ups. Now when it comes to dieting… We have some bad news for you meat-lovers. Research at the Committee for Responsible Medicine found in a 1989 study that some of the top foods that aggravate osteoarthritis symptoms were processed meat, red meat, fats, sugar, salt and caffeine. It’s true that studies do show that vegetarian diets are much better for osteoarthritis, but generally speaking, as long as you do not consume too many of the above mentioned foods too often, and make sure to sparse it out with plenty of fresh vegetables and fruits (but not too many fruits, watch out for that sugar!). More than 20 million Americans are affected by osteoarthritis, most of them being over the age of 45. Unfortunately, too many of them underestimate the importance of diet and exercise and leave themselves vulnerable to painful flare ups and complications. Avoid this pitfall by making smart decisions based on our guide above!